Beaterator Impressions: Can Rockstar Make You A Music Star? The music games designed to make you feel like a guitar hero or a Beatle get the biggest headlines. But game developers have also repeatedly tried to harness gaming technology to help you be a musician. Now it's Rockstar's turn. Last week, the studio behind the renowned Grand Theft Auto series and more eclectic fare such as Bully and their very own table tennis game, let me visit to witness a session of Beaterator. The application — they don't call it a "game" — is a September-slated portable digital music studio that traces back to Rockstar's 2005 Internet application of the same name. The hook is that Beaterator is digital music creation made easier. The fantasy is to be Timbaland. The superstar producer doesn't just lend his name and cartoon likeness to the game. He presides over the catchiest tutorial video I've witnessed in a … an application. It seems, at first, that Timbaland is simply talking to you, telling you how Beaterator works, but with a sample here, an echo of his voice there, a building beat beneath it all, you realize he's made music out of talking. And suddenly it seems like we all have a shot at this making-music thing. The Timbaland tutorial presents the program's sections: Live Play, Studio and Song Crafter. Live Play is the most graspable mode, the most visually appealing and the one most suited for those of us who have never dug deeper in making music than messing around with Nintendo's Electroplankton or the drum fills in Harmonix's Rock Band. Timbaland stands in the center of the PSP screen. The four corners display four possible sound and beat samples out of the programs' several thousand available. In total eight tracks are in play in this mode. Selecting what to play on any of them involves picking from four randomly offered samples presented by Beaterator. Selecting a corner and pressing one of the PSP's four face buttons kicks in a beat or some sort of loop. The user can layer on up to eight, switching tracks in and out, narrowing their offerings by choosing from a musical style like, say, hip-hop. Beaterator smooths the timing of the loops, linking the user-selected samples and sounds into an on-beat, on-rhythm mix. The idea is that you'll tap around and come up with something catchy and unique. Studio lets you manipulate the song you'd made. Each of the eight tracks can be isolated and have its levels raised or lowered. The song can be sped up or slowed down. While there's greater manual control of a song in this mode, it struck me that Studio is the wading area that is meant to prep users who aren't ready to move into the deep end of the Song Crafter. This third mode, Song Crafter is essentially a PSP-ified ProTools or other computer audio mixing program. A song's tracks are represented as color-coded portions of horizontal lines. Those chunks can be chopped up, copied, deleted or moved. New samples can be brought in, including audio captured via the PSPgo or PSP 3000's mic or through a .wav file. So, yes, you can sing or rap to your creations. The option in Song Crafter appeared to be deep, offering an 88-key synthesizer keyboard for composition, an interface for creating and manipulating drum patterns, an interface for adjusting things like "Decay" and "Detune." The Rockstar rep who showed me Beaterator and managed to make a catchy enough song during our brief demo said that some of Beaterator's deepest options are too esoteric even for him to use. But he presents the complete package as an effort by Rockstar to lessen the intimidation factor for creating music. Rockstar plans to support Beaterator with downloadable content and is working out plans to enable exporting and uploading of songs. A simplified version of the application was also recently announced for the iPhone and iPod Touch. According to Rockstar press materials, that version won't have the advanced song-editing options of the PSP release. 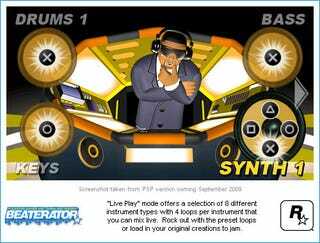 It's hard to judge how successful Beaterator will be in the hands of PSP users. I'm used to judging Rockstar creations by their gameplay and fun. What I saw looked thorough and smart, but it'll be for PSP owners to decide whether they have an appetite for making music or a hidden desire that everything from Guitar Hero to Wii Music failed to satisfy. To make music, with the help of a video game platform, this is your next shot. The PSP edition of Beaterator launches on September 29 for $39.99.